Last night, our Life Sized, Marie Antoinette inspired Macaron Dress was featured on Made in Chelsea at Mark Francis' Baroque Soiree. The dress, which was created by Ganache Macaron, in collaboration with Tasha Krestova, was unveiled back in September, at London's National Wedding Show. After seeing it, the Made in Chelsea production team thought it would be a fantastic statement piece for Mark Francis' lavish baroque-themed birthday party. The soiree also featured a cellist playing Bach and a ChoccyWoccyDooDah Cake, alongside the high drama and high fashion (and some "bin-bag fashion") that one has come to expect from Made in Chelsea. If you can't get enough of Made in Chelsea, or if you are dying to see our Macaron Dress on TV you can look for Made in Chelsea, Series 6, Episode 8 on Channel 4 On Demand. It seems like only yesterday we were taking our life-sized macaron wedding dress to London's National Wedding Show and now we are quickly nearing our next big event, Taste of Christmas. In just over two weeks we will be at Taste of Christmas at London's Tobacco Docks. 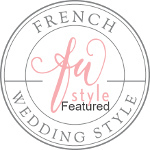 Nothing says "French Wedding Style" more than the simple elegance of macarons. Their sleek shells, the delicate ripples of their "pied" (or "foot") and the variety of colour possibilities make them one of the most fashionable treats around.